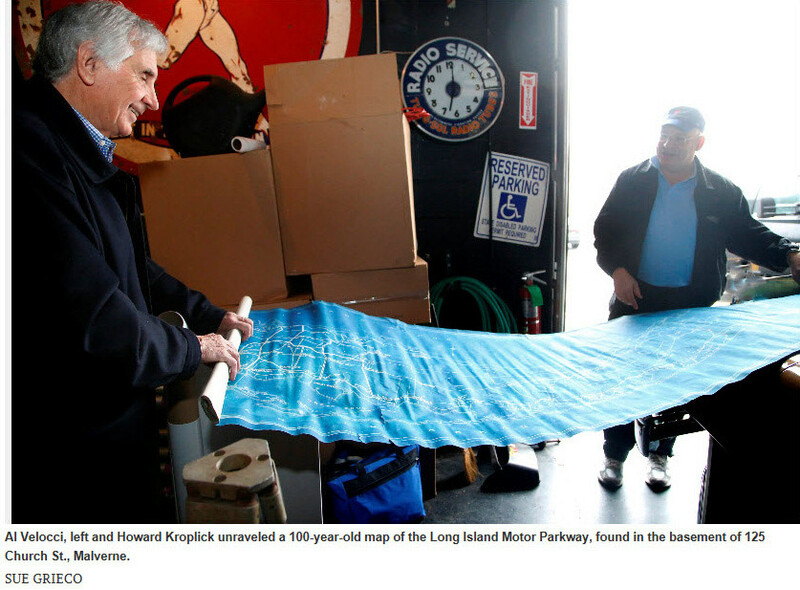 A treasure trove of original survey maps of the Long Island Motor Parkway — the country’s first road built exclusively for automobiles, in 1908 — have been in the basement of a Malverne business, the Learning Circle, for decades. “I saw them about 20 years ago and I didn’t pay much attention to them,” said Roy Knoernschild, an on-call custodian for the building. 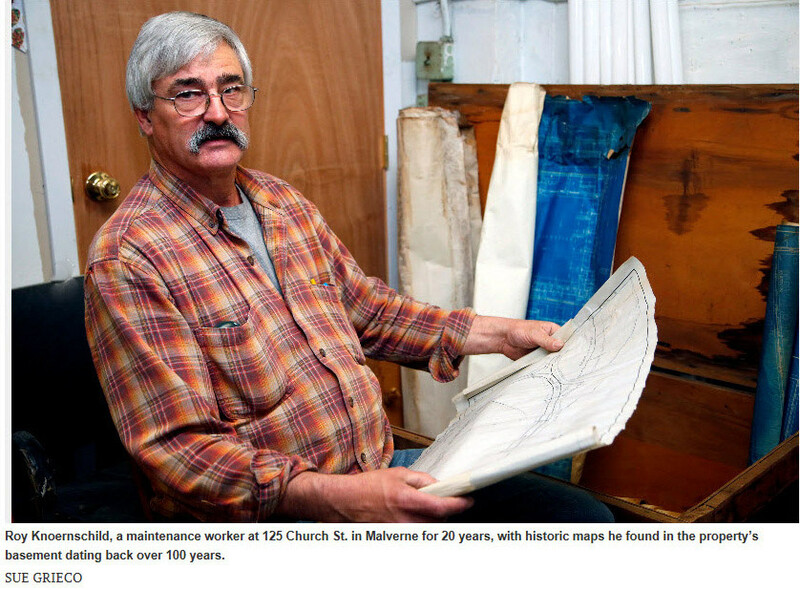 Ten years ago, the building’s owner, Paul Weissbluth, an engineer, reached out to the Malverne Historical Society about the maps, but never received a call back. Weissbluth died two years later, and the maps stayed in the basement, in an old wooden crate, for another eight years. Recently, Knoernschild, who lives in Baldwin, was cleaning up the basement and saw the chest again. He examined the contents and found many maps documenting the layout of the Motor Parkway. He began researching the parkway’s historical significance, and tried to find someone who would appreciate and preserve the maps. That person was Howard Kroplick. 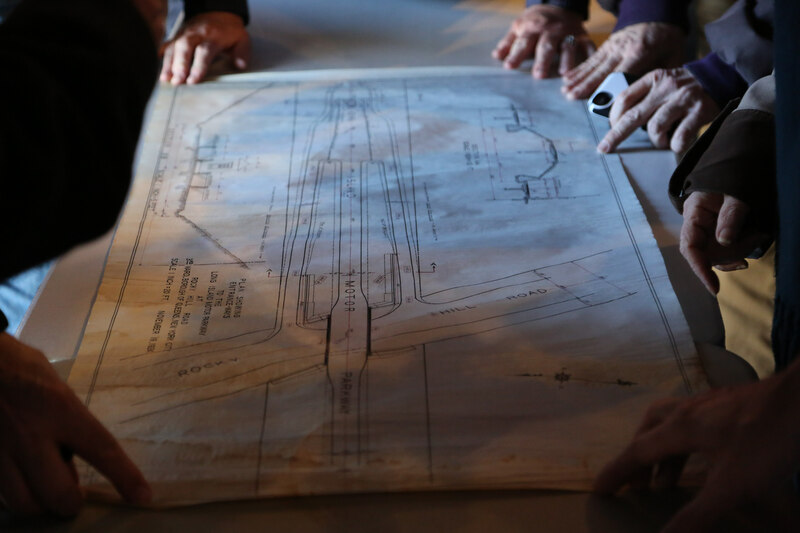 Many of the maps, some dating back to 1906, detail the roads, bridges, toll booths and other structures that were built by William K. Vanderbilt Jr., a race car enthusiast and great grandson of the shipping and railroad tycoon, Cornelius Vanderbilt. William wanted to build a race course for the Vanderbilt Cup Races that could also be used as a toll road for people to drive from New York City to Lake Ronkonkoma. 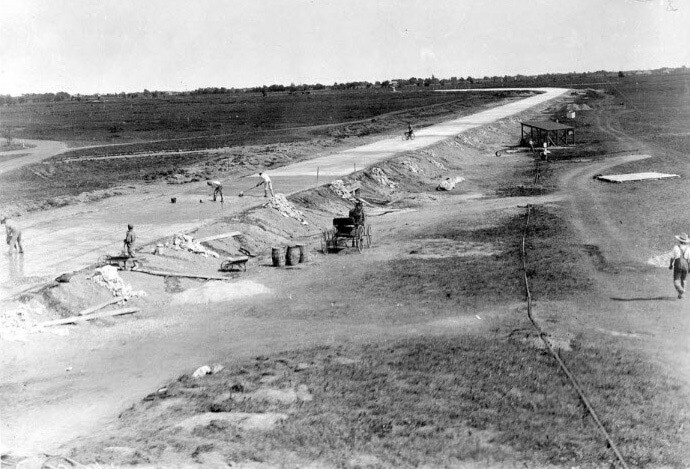 The result ­— the Long Island Motor Parkway — became the country’s first paved roadway used exclusively for cars. 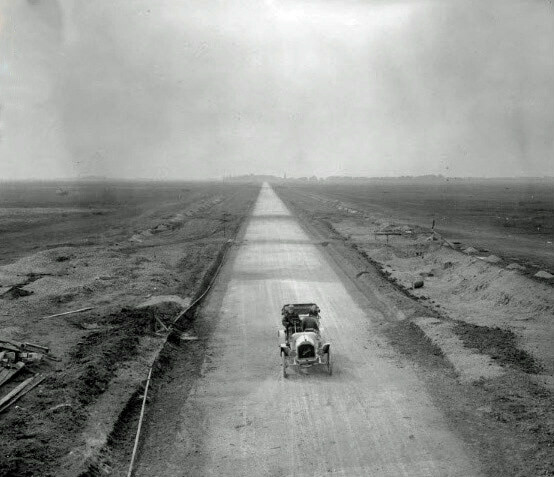 Built in segments between 1904 and 1929, the parkway stretched 44 miles, starting in Fresh Meadows, Queens, and ending near where Vanderbilt had a summer home on Lake Ronkonkoma. Arthur Archibald, a Village of Hempstead surveyor from 1906 through the 1930s, created most of the maps. Eventually, Teas and Steinbrenner, a surveying company that worked out of 125 Church St. — known today as the Learning Circle — purchased Archibald’s maps, Kroplick said. “What happens with these surveyors is, after they go out of busines, all their surveys get purchased by another survey house,” said Kroplick. That way, if something went wrong, original maps were available to help solve the problem, he explained. Knoernschild said that that before it became the Learning Circle, 125 Church St. had a fireproof room where all the maps were located. When the Learning Circle leased the building 20 years ago, the fireproof room and other parts of the building, were converted into classrooms and the chest full of historic maps was moved downstairs. The maps are now being cataloged before being scanned. Kroplick said he would share the map scans on his website, VanderbiltCupRaces.com. Kroplick, the owner of the Alco Black Beast, which won the 1909 and 1910 Vanderbilt Cup Races, has been a passionate history buff of the Long Island Motor Parkway and the Vanderbilt Cup Races for almost 10 years, as has Al Velocci, a research volunteer at the Suffolk County Vanderbilt Museum and a member of the Long Island Motor Parkway Preservation Society. Kroplick and Velocci have written books together and separately on the two topics, and have also cleaned some of Motor Parkway’s bridges that still exist today. Sixty-five bridges were built in all. The Motor Parkway opened on Oct. 10, 1908, and the first Vanderbilt Cup Race held on the Motor Parkway was held that Oct. 24. It was estimated that there were 200,000 spectators along the course, which was 23.46 miles. In 1909 and 1910, the race was held on a shorter course. 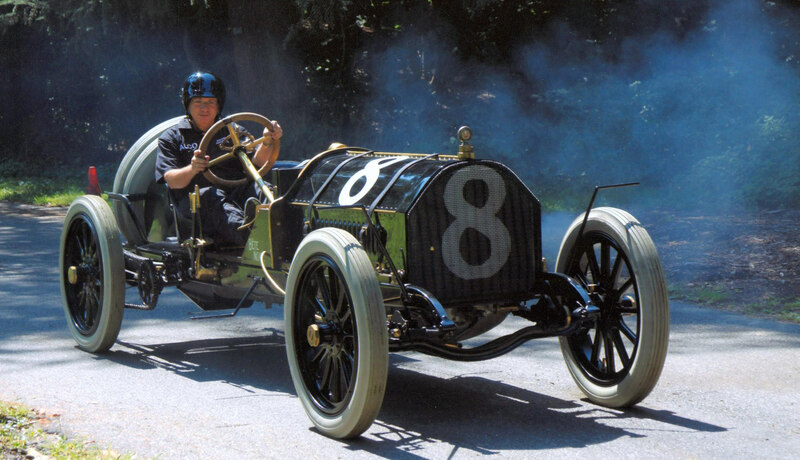 During the 1910 race, two mechanics were killed and careering cars injured several spectators. The two deaths eventually put an end to road racing on Long Island. The Long Island Motor Parkway was built at a cost of $5 million, which proved difficult for Vanderbilt to recoup, despite charging a $2 toll — roughly $45 today — and the growing popularity of cars during the early 20th century. The toll was eventually reduced to draw more traffic, but that didn’t help. The Great Depression, combined with the state’s growing free parkway system, put an end of the Long Island Motor Parkway. It officially closed on April 17, 1938, and was turned over to Queens, Nassau and Suffolk counties in return for dismissal of $80,000 in back taxes. Sections of the parkway still exist today, including a bicycle path in Queens, County Road 67 in Suffolk County and a variety of other roadways. Some sections were sold off to real estate developers or were turned over to utility companies for power lines, according to the book, “The Long Island Motor Parkway,” written by Kroplick and Velocci. Roy cared enough to make sure these maps didn’t go to the wayside. He took that extra mile, and the maps are in good hands ( Howard’s). A round of applause to Roy!